Metacafe is one of the world's largest video-sharing websites, which has specialized in short-form video entertainment in the categories of movies, games, music, etc. 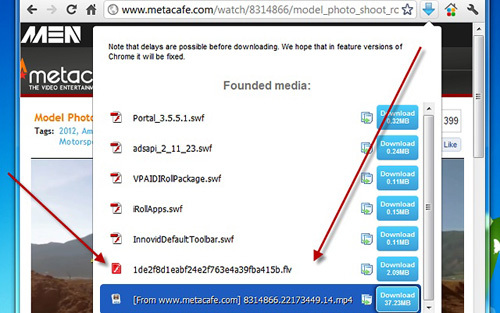 Here are 4 different methods to get the media files from Metacafe, of course, for free. With the free screen activity capture software Any Video Recorder; Netflix, Hulu, YouTube, Metacafe, the encrypted videos could be easily ripped and the normal videos could be easily recorded in 4 steps. Step 1: Download the program from its website, and launch the application. Step 2: Set the file name, directories, framerate and bitrate. Generally, the high the framerate is, the smoother the video playback will be; the higher the video bitrate, the clearer the video image would be. Step 3: Play the Metacafe video that you want to get, and click the "Record Now" button. The video would be automatically detected, or you can drag the red frame to reset it. 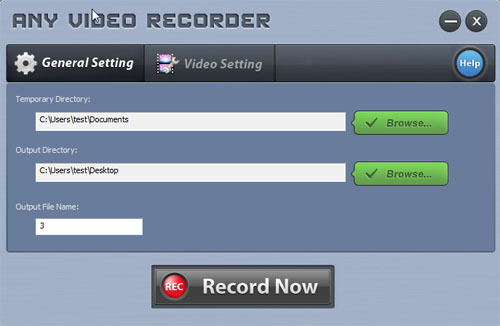 Step 4: Click the red button to start recording. And click the red button to stop recording. Add-ons are needed. Click Firefox -> Add-ons, there are thousands of plugins, and you can search for 2 of them to download Metacafe videos. One is DownloadHelper, and the other is NetVideoHunter. Then click the Install button, and restart Firefox, they would appear on the left top of the browser. The plugins are not restricted for Metacafe, it works for almost all website. Every time you play a video or song, the icon of DownloadHelper spins, while the icon of NetVideoHunter flickers. And compare with DownloadHelper, NetVideoHunter is much more smarter on the medias' names. A plugin needed too. Go to its Chrome Web Store, search for FVD Video Downloader, and "ADD TO CHROME". If there's a downloadable video available on the page that you are viewing, the arrow button in Chrome changes its color to blue. It almost downloads videos from all websites, but Due to the Chrome Webstore policy, users are not allowed to download YouTube videos. And it does not work at the sites that offer videos protected by copyright, such as Vevo, Warner Bros, Sony Music, etc. Orbit Downloader is free Metacafe download software, and it could also work for other video sites. After the software being installed, hover your mouse on the Metacafe Video that you are watching, you will see a small button with an arrow and "GetIt" appeared near your mouse, click the button to get video downloaded through Orbit Downloaders.